Xtre­me Events has been offe­ring pre­mi­um event modu­les for more than 20 years. From child actions such as the Pira­te Ship boun­cing cast­le over fun sports and simu­la­tors up to high end event modu­les such as the Air Power or Hou­se Run­ning. Have a look at our new the­me worlds as well. 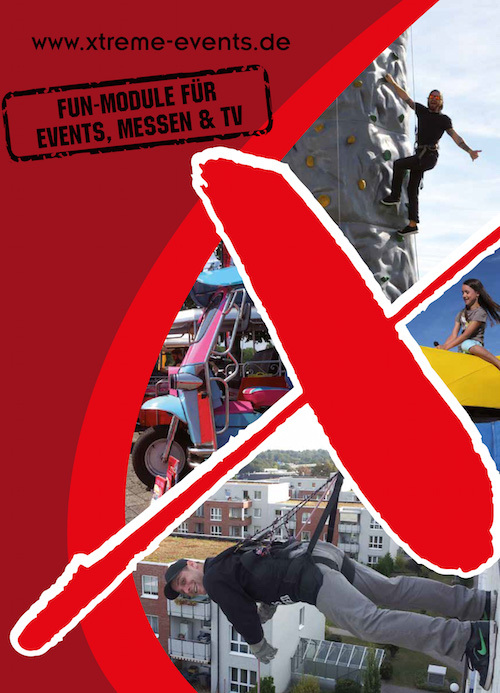 Here you will find a wide choice of rodeo devices, simu­la­tors, tram­po­li­nes, human kicker soc­cer games, clim­bing moun­ta­ins and still more! With a gre­at choice of modern and safe event modu­les, Xtre­me Event Ser­vices offers a per­fect set­ting for your event. If you are inde­cisi­ve about which modu­le best suits your event, our employees are hap­py to help you with the plan­ning as well as the rea­li­sa­ti­on on site. Due to an own vehi­cle fleet, Xtre­me Events is able to deploy all boo­ked event modu­les wit­hin Euro­pe. As you can see, working toge­ther with Xtre­me Events offers many advan­ta­ges – con­vin­ce yours­elf and order our free event cata­lo­gue or start your indi­vi­du­al enqui­ry now.